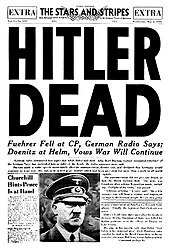 Hitler, to no one’s regret, killed his chicken self on this day in 1945. Satan’s servant failed miserably in his quest to complete his Final Solution and is now in the presence of God’s wrath for all eternity. Now meet Agnes Kun an Auschwitz survivor, imprisoned in Hitler’s death camp when she was 18. My girls and I met her yesterday at the Museum of Tolerance Museum. 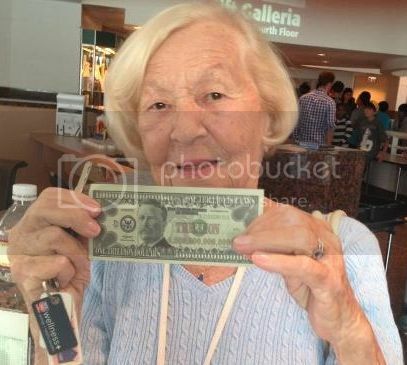 I gave her a Trillion Dollar Bill Gospel tract and asked her to what she attributed her survival to. I then explained to her that it was not luck at all, but it was God who spared her. I then requested that she read the information on the back of the tract so that she may learn of her Messiah, Yeshua Ha’Mashiach, Jesus, the Messiah. Corrie Ten Boom was a prisoner in Ravensbruck, another horrible concentration camp, a camp where she witnessed her sister’s death. She attributed her survival to Jesus Christ. “And that’s when I saw him, working his way forward against the others. One moment I saw the overcoat and the brown hat; the next, a blue uniform and a visored cap with its skull and crossbones. It came back with a rush: the huge room with its harsh overhead lights; the pathetic pile of dresses and shoes in the center of the floor; the shame of walking naked past this man. I could see my sister’s frail form ahead of me, ribs sharp beneath the parchment skin. Betsie, how thin you were! “ ‘You mentioned Ravensbruck in your talk,’ he was saying, ‘I was a guard there.’ No, he did not remember me. Read the rest by clicking here. I’m curious Steve, if you believe that when you die, and will no longer feel sorry or sad for those people who are burning forever in hell (because you’ll realize how awful they are), why do you even bother treating what Hitler did with such belligerent text. Hitler believed in God, and was removing undesirables from German society, homosexuals, jews, communists, atheists, and sects of Christianity that were undesirable to the state, or those who had conflicting ideas of Christianity that differed from the tradition in other words (sound familiar? ), and if you believe that people of that like (maybe not the Christians) will burn forever anyways ie. the Jews, because they don’t believe reality works the way you do…. why even bother? You’ve already ceded caring by saying when you die you’ll just accept their eternal suffering and be happy with it. Perhaps you and Martin Luther can chuckle about the eternal suffering of Jews in hell when you’re chatting it up in heaven? Correction: We will rejoice because we will see that God was just in His verdict. Correction: A god of his own making, not the God of the Bible. The Christian God was “too Jewish” for Hitler. Correction: It does sound familiar in that other demagogues have tried the same throughout history and have failed. Is that what you mean? I suspect not. Error #4: All the rest. Correction: Get your nose out of all those science books and read some good conservative theologians. And maybe even get a Systmatic Theology book or two. And read your Bible (or borrow a friend’s). Cheers! I have, and watched some debates too, they usually side step the same hard moral questions that you seem to be side stepping right now. Your post seems to rag on Hitler, because, quite frankly, that’s an easy thing to do, but the question is why? You admit that you will rejoice when you discover that all of those Jews who were gassed to death by the Nazi’s are now safely roasting in hell, so why bother even feigning compassion when that sense of compassion or sympathy with their situation and plight will be stripped of you when you die? Interestingly enough I didn’t even know the Museum of Tolerance actually exists… may I ask why you wanted to go there… besides the obvious evangelism. I’m teaching my girls about WW2 and wanted them to see one of the reasons why this was a just war. Then I suggest you have them research the Hitler Diaries fraud. Yet, if Hitler had lived and became a Christian, you’d give him a big hug and kiss when you got to Heaven, right? He didn’t, so I won’t. How do you know? Were you there at the moment of his death? Nope. Chances are pretty good that his heart was hard. Can’t say for certain, so you are right there. Thanks so much for sharing Corrie Ten Boom’s account, Steve. A sobering reminder of the forgiveness God bestowed upon me for my countless sins against Him through so many people I hurt along the way in my life. My sins did not go unpunished. By God’s immeasurable love, grace and provision, He sent His Son, Jesus, to earth God the Father punished Him for the sins I committed even though Jesus was innocent. In turn, through repentance and faith, I was completely forgiven and granted eternal life in Heaven. I will now stand before God after I physically die and be seen as though I had never sinned. God’s grace is beyond amazing. And, unlike Corrie, Jesus never thought twice about having to die for His people. He did what He came to do…save sinners from their sin and bring His sheep into the fold…forever. God’s love and faithfulness is amazing. Each day I live on this earth makes me appreciate more and more his amazing grace towards me and all who repent. He is not responsible to maintain the world as we know it. Yet, he does. If Hitler was Satan’s servant then why would Satan punish him when he got to Hell? I don’t get it. God will punish him, not Satan.